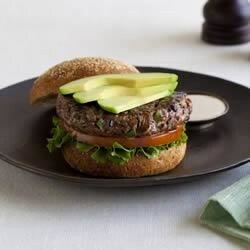 "This beef and veggie burger adds extra produce to your burger patty making it more flavorful and juicy. Then it is topped with Fresh California Avocado, lettuce and tomato. It is great served with the Steakhouse Lite Ranch Sauce and fresh veggies like carrots and celery for dipping, making this a produce packed meal. Good source of Vitamin C, Calcium and Iron." In a bowl mix together the onion, bell pepper, mushrooms, steak sauce and lean ground beef. Mix very thoroughly with your hands to combine all ingredients. Divide the mixture into equal portions. With your hands press each portion into a ball and then shape into a patty. In a saute pan or on a flat griddle over medium low heat place the patties and grill for about 4 minutes, flip and grill an additional 4 minutes or until meat is thoroughly cooked. While beef and veggie burgers are grilling toast the buns. Top each bun base with the beef and veggie burger, then drizzle each with 1/2 tsp. steak sauce. Top with the lettuce, tomato, Fresh California Avocado and bun top. Optional: serve with Steakhouse Lite Ranch Sauce for dipping. 1. In a bowl mix together all ingredients for sauce. 1. A vegan veggie patty may be substituted for the beef and veggie Burger. Nutrition information per serving: Calories 630; Total Fat 43 g (Sat 13 g, Trans 2 g, Poly 3 g, Mono 18 g); Cholesterol 90 mg; Sodium 860 mg; Potassium 580 mg; Total Carbohydrates 40 g; Dietary Fiber 9 g; Total Sugars 5 g; Protein 26 g; Vitamin A 306 (IU); Vitamin 11 mg; Calcium 144 mg; Iron 4.6 mg; Vitamin D 0.5 (IU); Folate 82 mcg; Omega 3 Fatty Acid 0.14 g.
Someone forgot the ingredients list to make the Steakhouse Lite Ranch Sauce. The patty of this burger was awful. Next time I want vegetables in my meat, I'll put them on top!